The British cycling legend admitted that Simon Yates is thriving better at Mitchelton-Scott than he would have on Sky. FLORENCE, Italy (VN) — Bradley Wiggins, Great Britain’s first Tour de France winner, could not see Simon Yates winning the Vuelta a España had he joined Team Sky. 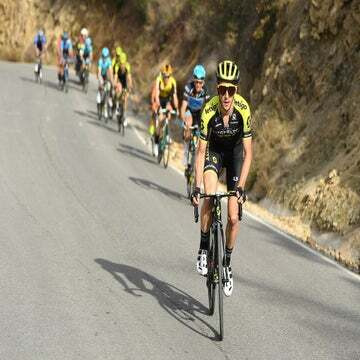 Yates conquered the Spanish grand tour Sunday. Team Mitchelton-Scott has been working to develop the Englishman since he joined with twin brother Adam Yates in 2014. The win came after a seventh-place result in the 2017 Tour. In the 2018 Giro d’Italia, Yates cracked with two days remaining and placed 21st. Before that, he led the race for 13 days and won three stages. “If he’d gone to Sky, I don’t think he’d have won the Vuelta,” Wiggins said on a Eurosport show. Yates raced in the highly regarded British Academy program that produced Geraint Thomas, winner of the Tour this year, and Mark Cavendish. The Yates feared they would be smothered by the talented riders and lost on Sky’s deep roster. After the Mitchelton franchise signed Simon Yates, it took him to the 2014 Tour. At Team Sky, Chris Froome continued to dominate. He won four Tours and the Vuelta, and this spring he rode clear to the overall Giro title when Simon Yates crumbled. It supported Richie Porte and Geraint Thomas too, the latter winning the 2018 Tour this summer. Team Sky signed super domestiques to support the captains. Yates risked slipping into a helper’s roll without room to shine. Others, including Americans Ian Boswell and Joe Dombrowski, worked well but have since transferred to different squads after their debuts with the British team. The Yates form part of Mitchelton’s grand tour trio with Colombian Esteban Chaves. Both have won the white jersey of best young rider in the Tour de France. Adam Yates did so in 2016 when he placed fourth. Now, the team has its first grand tour victory with Simon Yates’s Vuelta title. “We all knew that Simon was capable of it,” Wiggins added. “To execute it was obviously another thing, but I’m certainly not surprised because he’s been knocking on the door for years. “We asked whether [the Giro] could have been the best thing that ever happened to him and I think it probably was because he’s learned from it and now he’s won the Vuelta.